I’ve had a chance to check out and use the new Mackie DL1608 digital mixer for a while, and if I had to use a single word for the review it would be "cool." Mackie has managed to put together a small package with a lot of great features, and paired it with an Apple iPad for the control surface. Above the tray area are 16 gain controls for the channels, and each one has its own dual color LED for signal and clipping indication. A 1/4-inch headphone jack and rotary headphone level knob complete the front surface controls. 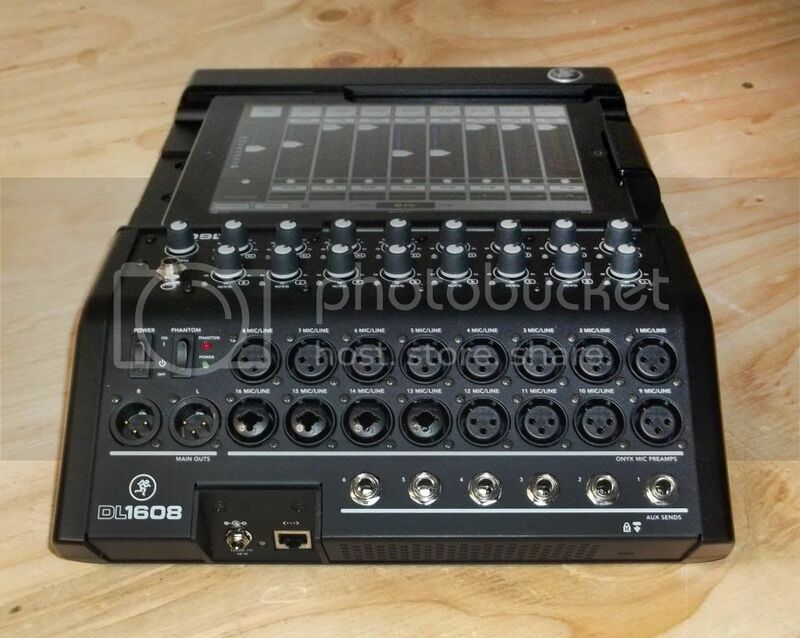 The rear of the mixer sports 16 XLR connectors for the channel inputs, with the last four being combo connectors, accepting both 1/4-inch and XLR plugs. Two XLRs for the stereo left and right main outputs are located alongside the inputs and the unit’s power switch and global phantom power switch are located directly above the main outputs. Six 1/4-inch TRS jacks are located underneath the inputs and are used for the aux outputs. An RJ45 network connector, Kensington lock slot and power connector complete the connections located at the rear. Speaking of power, Mackie has supplied a very nice universal 12-volt power supply with the unit. It's of the “line lump” variety and will accept any voltage from 100 to 240 volts AC. A removable IEC plug connects to the “power block” (line lump), allowing an easy swap of the cable for one that will connect to local outlets anywhere in the world. The other end of the power block connects to the mixer via a locking screw on connector so it won’t disconnect during use. Mackie has chosen to place all the mixer controls (with the exception of power, gain, headphone level, and phantom power) in the iPad. The DL1608’s Master Fader app is available free from the iPad App Store and, at least to me, is the nicest looking and easiest to get around software for mixer control that I have seen, providing quite a bit of information to the operator at a glance. In mix mode, eight channels can be shown on the screen at any one time, along with the master fader. Swiping a finger left or right scrolls through the available input channels. Each channel sports a thumbnail view of the EQ curve, mute button, pan slider, gain reduction meter, fader level, input meter, and solo button. Below each channel fader is the channel ID area where you can use the default numbers for the channels, type in your own names, choose factory names like “kick” or “guitar” or even take a picture of a band member or instrument with the iPad and display that image. Tapping on the EQ thumbnail of a channel will open up the “Channel View” and allow access to EQ, dynamics and effects. here is a button located at the top of every channel view screen that will take you back to the main mixer. The first screen that opens up in channel view controls the EQ. The DL1608 offers 4-band parametric EQ, or the 1st and 4th bands can be set to shelving mode with adjustable gain and frequency. There is also an adjustable high-pass filter available, EQ in/out, as well as a polarity button for the channel. Note that while in channel view, the channel fader is still located to the left of the screen, and the master fader is located to the right. A nice touch – no matter what screen you're in, the master fader is always available. Swiping up on the EQ screen presents the gate and compressor controls. The DL1608 features two dedicated effects processors, one for reverb, and the other for delay. The FX screen allows choosing between a variety of reverb or delay, as well as adjust parameters and the send and return levels. The master screen is accessed by tapping on the EQ thumbnail over the master faders. You can engage a 31-band graphic EQ, as well as an output compressor limiter for the main outputs and each aux output. There are small icons to the right of the main faders that offer a selection of output screens, with each screen placing the sends for each channel on faders. The DL1608 can be used as a stand-alone console by docking an iPad in the tray. There is a locking clamp supplied with security hex head bolts that can be installed to help keep the iPad from “walking away” when left unattended. To use the iPad as a wireless remote controller, all that's need is a wi-fi router. Setup is easy, and the iPad can be slid in and out as often as the user likes with no glitch in the audio. Note that there will be a second or two of lag time before audio can be controlled as the software reads whether it’s wireless or docked, but the audio will continue to pass at the last settings. Another nifty feature is that the mixer can be accessed by up to 10 iPads at the same time, and v1.3 allows you to lock out controls so band members only have access to the controls you allow. I also liked that I could download the software for free and learn it before even getting my hands on the mixer. As with all gear in my Road Tests, I hooked up the DL1608 in my shop to play around with it before taking it out on a gig. I did note one small drawback – the lack of a stereo input. To hook up a CD player or iPod, I needed to use two of the combo inputs, and this also requires using the two channels for control as there is no way in the software to link channels together. The counter to this, however, is the built-in iPad audio channel that fosters the use of iTunes or another audio program for walk in/out music or cues. The drawback is that to control the music, you have to exit the Master Fader app and open up another program. While it doesn't take long for the Master Fader to open, those few seconds leave the operator without any control over the audio. And when in the Master Fader app, there is no access to the playback controls on the audio app. This is certainly not a deal breaker for me because I normally have a dedicated external audio playback unit on gigs when I need to play cues during a performance, but it would be nice to have a dedicated stereo channel. Following my shop evaluation, I took the DL1608 out to help me handle audio for a ribbon cutting ceremony for the opening of a new business. Apple AirPort Express provided the option of moving around or staying at the console – I did the latter, but unlocked the iPad during setup to make adjustments while walking the coverage area. I also had a playback unit with me but felt comfortable enough to play back songs directly from iTunes on the iPad for the walk in/out music. 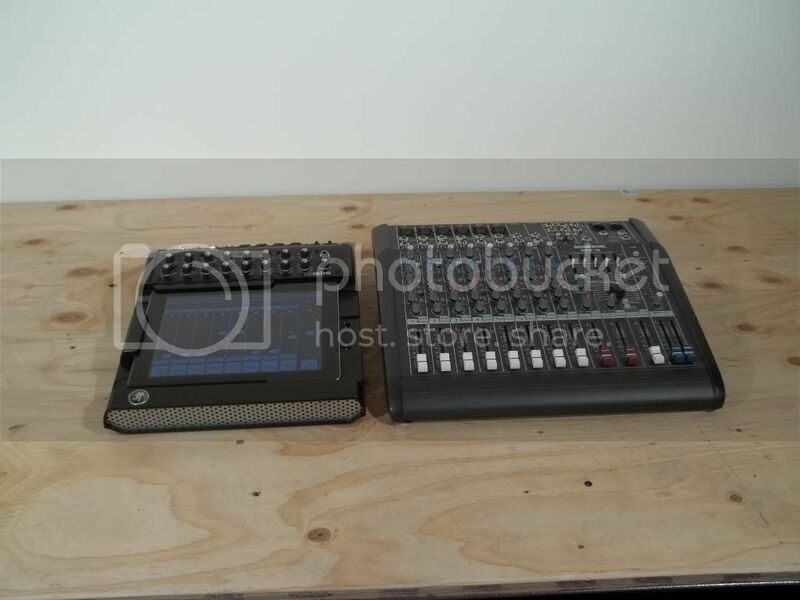 The next gig was a typical corporate meeting breakout room where I normally would deploy one of my Mackie DFX12 mixers. The inputs were a pair of podium microphones and a wireless mic system, as well as an audience Q&A wireless mic and computer audio. Normally I would run a small snake from the podium area back to a console at front of house, but instead, I placed the DL1608 at the stage and sat at FOH with just an iPad and laptop, running a mic to the mixer for audio from my laptop. The wi-fi worked great and saved me from running an 8-channel snake. With tons of great features in a compact, well-built package, as well as great sound and great software, Mackie has a real winner with the DL1608. This looks pretty useful. Does anyone know if there are similar creatures out there with a few more ins and outs? A 24/8 would suit me perfectly while a 16/6 is a bit restrictive for our current band. My other question is what goes in and out of that RJ45 port? You can't do 16 channel full duplex by any chance? I would imagine that you would use the RJ45 port to connect to your router. Looks like it talks to the iPad and nothing else. Shame. The Behringer X32 allows full multitrack recording and playback, so you can run your favourite VSTs live as well as recording everything. Of course, that's a big step up, but it's a nice feature. Recording the 2-track onto an iPad (as long as it's plugged in) is not so great. 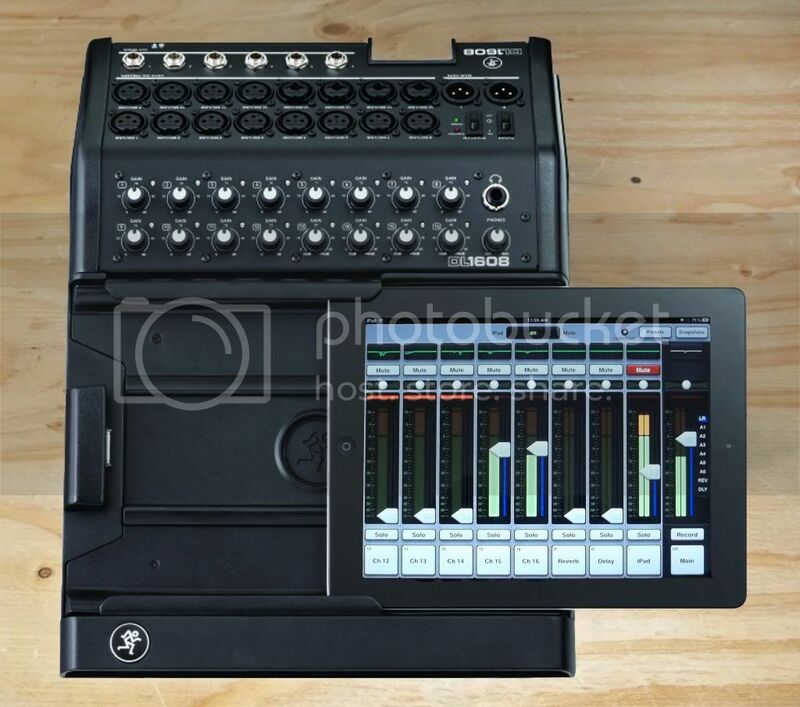 For an iPad mixer, I wouldn't expect it to work with all platforms. I think at the price point it's at, and the expected target audience the iPad is a better choice than a PC platform or any of the other tablets out there. Most audio products seem to have gravitated to the iPad as it's now becoming the most popular control interface. It will probably also work with the new iPad mini as that tablet seems to be just a smaller iPad. I'm hoping that they make an app for my iPhone that allows me to at least access one channel at a time. I don't really want to mix on my phone, but it would be handy to make monitor adjustments during soundcheck, or for tuning the system during set up. Also, a musician might prefer a smaller control surface like an iPhone or iPod touch for monitors instead of the bigger iPad. You are comparing Apples to Oranges. 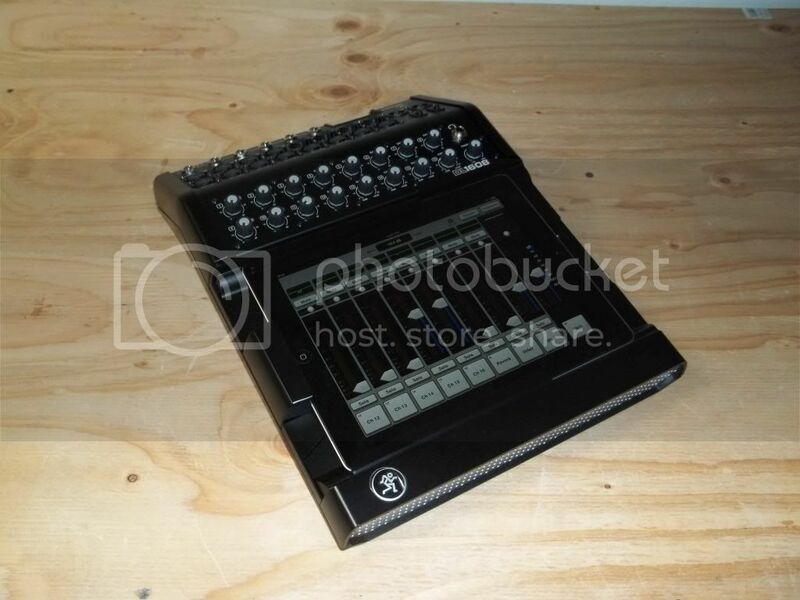 A quick look around the web shows the X32 sells for around 3K while the Mackie DL1608 is under 1K. Of course it is not going to have all the features of a console selling at that price point. I look at the onboard recording feature like it's a free extra, great for casual or emergency recording, but not the first recording device I am going to turn to. The NAMM show is just around the corner and Mackie may show off a larger version of the unit. They hinted to me last year that they intend to have a line of these type mixers, not just a single sized model. I'll post on here or the regular forums if they introduce anything, and of course we will have a show report in the magazine. As far as I can see the RJ45 port is just for connecting the router. Your are correct regarding the RJ45 connector. For a WAP connection only. i use the small Mac Airport and it has worked fine now for 2 months. No issues. With it recording to the IPAD docked only, will it allow a second IPAD to run the show in remote? It also allows the IPhone and Itouch. Yes, multiple iPads can control the mixer at the same time. A bit dumb question since I haven't seen the answer anywhere: iPad audio output via dock into DL1608 is way too hot (into clipping with noticeable distortion), and there's no way to adjust input gain on "iPad" channel like on all other channels. For some reason once docked to DL1608 the iPad audio output level ("volume") control is disabled in iTunes and couple of other playback apps that I've tried. For now playback from iPad directly into DL1608 is pretty much useless. Both MasterFader app and unit's firmware are up to date. Any ideas on how to get around it? Or did anyone tried another audio playback app that allows output level control while docked to Dl1608? Page created in 0.104 seconds with 23 queries.